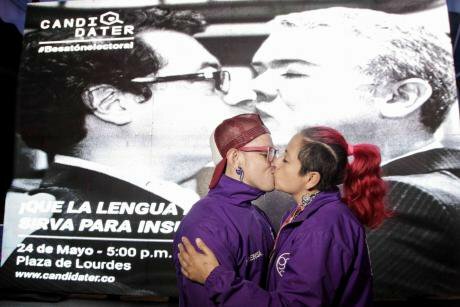 Kissing activity promoted by Candidater.co in Bogota City. Source: Diana Rey Melo / Revista Arcadia. All Rights Reserved. This article is part of the series "Ellections in Colombia 2018: depolarization and disinformation", developed in partnership with Nueva Sociedad Magazine and the Friedrich Ebert Foundation. The demagogic inertia of the presidential campaigns that we have witnesses over the past weeks in Colombia does not appear to have provided digital democracy with the weight and attention that should have been demanded and desired. It is estimated that around 35% of Twitter followers of the Colombian presidential candidates are fake. This is a contrast when viewed in light of the opportunities that exist for digital democracy that continue to be held in disdain by traditional, conventional and classic political campaigns. These campaigns dedicate little or no attention to true processes of urgent transformation, making the regeneration and incorporation of new forms of political participation more necessary than ever. The new logic of political innovation, social network collaboration, and reinvention of democratic participation reclaim a much-needed space that goes beyond rhetoric and marketing, and they continue being a relevant issue for these pending elections for both parties and candidates. Fortunately, many civil society actors have been driving tools to create precedents for digital democracy and these have been gauging some of the candidates for the up and coming elections. It would have been interesting if the candidates had responded regarding what they feel about certain topics of global interest, for example suffrage through blockchain, crowdsourcing legislation, or a distributed, cryptographic, and auditable digital democracy in which needs of politicians as intermediaries would be fulfilled with new forms of complementary participation. These would be thought out to improve the quality of a democracy that appears to have been kidnapped by the logic of conventional parties that strive to protect their own interests before those of the citizens of the country. I am certain that, when asked if they would be prepared to open up creatively to the proposed regeneration of digital democracy, the majority of candidates could only provide demagogic answers. In this cycle of presidential elections, initiatives such as sifuerapresidente.co, a platform that allows any citizen to direct proposals for the next government plan, or candidater.co, a democratic tinder that matches you with your ideal candidate, have attempted to drive politically experimental agendas with the aim of redesigning the participative paradigm and revitalising a system that as caused disappointment and outrage among voters. In this context, politicians should be able to find a necessary ally in technology that goes beyond filling the Twitter accounts of the bots that follow them. Given the dynamics of the campaign and the mainstream candidates, this has not been the case, and conservativism still occupies centre stage. Sooner or later, the transformation of political participation should be able to impact conventional politics. In the midst of such confusion regarding our democratic future, technology can act as a catalyst of change that, if led well, can allow for the remerging of social demands and political participation. Despite having seen throughout the campaign that politicians have failed to go beyond a conventional use of Facebook and Twitter, technology if well-used is the ideal bridge for generating agendas of collective intelligence that turn disappointment to deliberation, and outrage into acts of change. This process of political innovation should support itself with digital tools that help channel a great Colombian democratic debt: switching from an elected passive democracy to a deliberative active democracy. The segmentation that data achieves should be the formula to consolidate democratic innovations towards those who have been historically marginalised and have less representation. It is not only women, young people, and those traditionally ignored or excluded, but also other groups and marginalised minorities that can be incorporated into networks to propose and debate agendas, and include their voices throughout the elaboration of laws. To include them not just in rhetoric but also in the execution process. With regards to digital democracy, it would seem like every candidate is inhibited, but why? For fear of losing control? For fear of loosing their monopoly? And although political innovation is managed bottom-up by citizens and movements that demand this change, it does not seem that the next president will understand the need to adopt this transformation given the current candidates. It is a matter of urgency creating a more diverse, inclusive and deliberative democracy, but without candidates and political apparatus that are open to the innovation digital democracy can provide, Colombia will continue dragging its feet. In order to progress in a more cohesive and freer society in such times of impoverishing polarisation and manipulative disinformation, it is necessary to give a voice to an increasingly active and diverse citizenry. It would be great if the second round candidates paid any attention to this.